2 What We Do Developing technologies are continuing to change the way we all live and work. Now more than ever, we are able to work and live more time efficiently than ever imagined. Online marketers are turning to Internet driven technologies to reach out to more potential buyers in less time and with minimal effort. The Internet is being used to find out about everything including housing, travel, dining, recreation, and so much more. content-driven web sites provide users with the e information they seek, create brand Well-constructed, easily navigable, content awareness and establish credibility. Now, with faster processors and higher bandwidt bandwidths, hs, Internet surfers are enjoying multimedia experiences including virtual tours, ours, pictures, videos, and ssound ound all helping to enhance the shopping experience. The advent of virtual tours has allowed online marketers to implement highly effective pre pre-sales sales programs p that are increasing sales capture rates and reducing sales cycles. The challenge for online marketers is finding aan attractive, low cost virtual tour solution. The Facts As of August 2006, over half of American adult internet users (57%) have taken virtual tours of another location online. (2006 Pew Internet & American Life Study) On a typical day, more than six million people are taking virtual tours in cyberspace, up from roughly two million in (2006 Pew Internet & American Life Study) 79% of repeat buyers & 84% of first time buyers use the internet to search fo forr a home. (2006 National Association of Realtors Survey) 54% of home buyers who are searching for their next home on Realtor.com ealtor.com will only look at homes with multiple images or a featured tour. 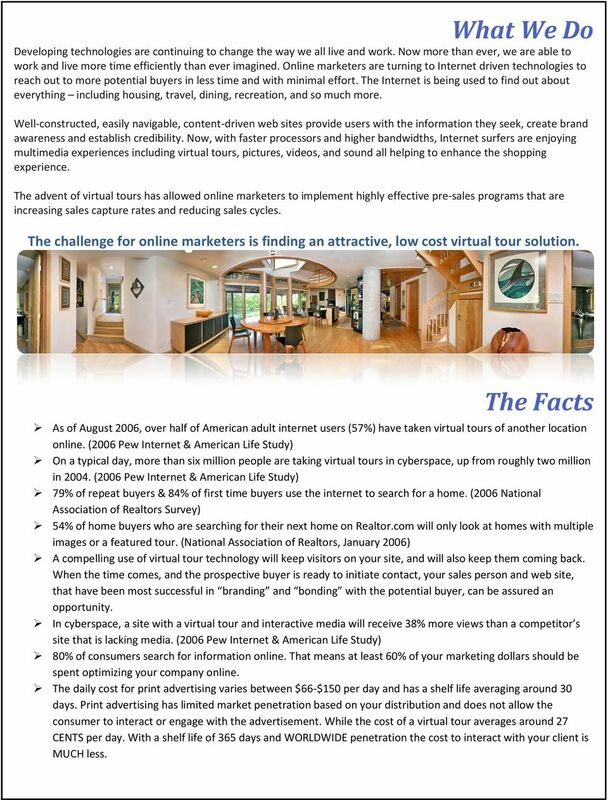 (National Association of Realtors, January 2006) A compelling use of virtual tour technology will keep visitors on your site, and will also keep them coming back. When the time comes, and the prospective buyer is ready to initiate contact, your sales person and web site, that have been most successful in branding aand nd bonding with the potential buyer, can be assured an opportunity. In cyberspace, a site with a virtual tour and interactive media will receive 38% more views than a competitor s site that is lacking media. (2006 Pew Internet & American Life Study) 80% of consumers search for information online. That means at least 60% of your marketing dollars should be spent optimizing your company online. The daily cost for print advertising varies between $66 $66-$150 $150 per day and has a shelf life averaging around 30 3 days. Print advertising has limited market penetration based on your distribution and does not allow the consumer to interact or engage with the advertisement. While the cost of a virtual tour averages around 27 CENTS per day. With a shelf life of 365 days and WORLDWIDE penetration the cost to interact with your client is MUCH less. 3 Virtual Tour Features 1. Custom banner for each realtor or owner. 2. Agent or Owner contact information 3. The Agent or Owner photo can be added to further customize and market each tour. 4. Instantly view more virtual tours by visiting the tour gallery. 5. Agent or Owner links to their and Web site. 6. Professionally voiced premium audio, with or without music, can be added to any virtual tour. 7. Video- The Video button allows you to add a video clip to your virtual tour for enhancing user experience with motion and sound. 8. Slide Show- This wonderful slideshow feature will showcase all of your snapshots within the virtual tour in a slide by slide presentation. 9. button allows viewers to a link of the tour to family and friends. 10. The Download button allows viewers to download the tour as a program file for quick and easy distribution by CD, or other types of media. 11. The favorite s button allows viewers to add this tour to the favorites section of their web browser. 12. 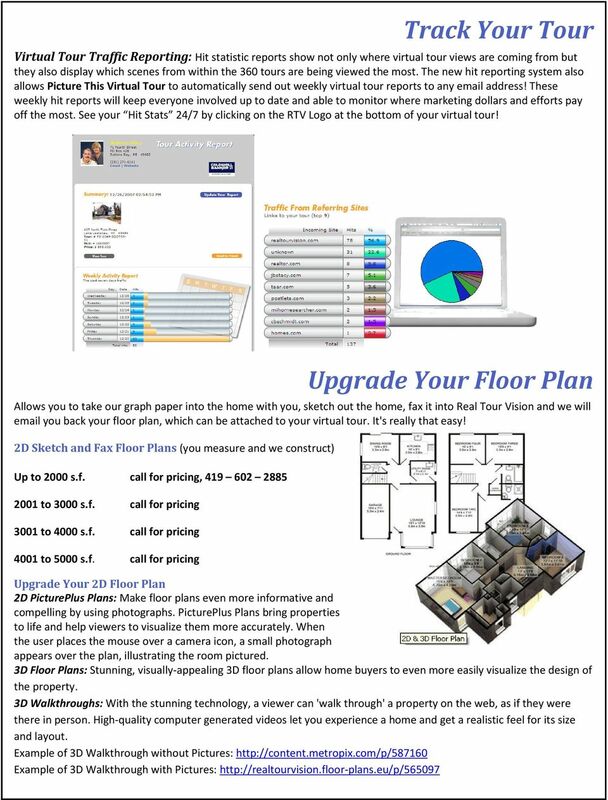 Custom printable flyers and floor plans can be included with every tour, providing additional tour details. 13. Additional information about the city can be accessed on every tour. 14. Detailed information on public libraries as well as local and private schools is included with every tour. 15. Automatic maps of the location of each tour for the convenience of the tour viewer. 16. An overhead aerial and satellite view is placed on every tour. 17. Mortgage Info- The mortgage info button allows you to calculate estimated mortgage information. The button can be redirected to your preferred mortgage vendor s site as a lead generator. 18. The Back/Next button returns the viewers to the previous scene or takes them to the next scene. 19. The tour title is displayed in the upper left hand corner. 20. RTV makes navigating through tours very easy. Help is just a click away. 21. Each scene within the tour is accessible with our drop down shortcut menu. 22. Add marketing partners that participate in advertising with you or your company. 23. Detailed MLS information is included with every tour. 24. The tour window is larger than other companies, without compromising download speed. Images appear crisp and glossy, and window shots are not washed out. 25. All tours have Hot Spots that can be customized for each client. Hot Spots give the viewer information and a sense of direction within the tour. 26. Navigation buttons give viewers control over turning left, right, up, down, and zoom in or out. 27. The text box shows what room or scene the viewer is in. 28. Spinfo- This allows you to enter a text based description of each scene within the virtual tour. 29. Company logo or real estate/owner logo. 30. Skin colors are customizable on every tour allowing you to fully personalize your virtual tours. 31. Hit Counter- This secret button allows the Realtor or the home seller to check tour hit traffic at any time! 4 Distribute Your Tour Virtual tour syndication yndication just makes sense. You know that when you generate more exposure for your listings, they are likely to sell quicker and at a higher dollar value. W Who has the time to re-enter a single real estate listing into hundreds of syndication and distribution systems? Most people do not and that is why Picture This Virtual Tour has direct access to the PicturePath distribution portal through Realtor.c Realtor.com om and Move.com (formerly Homestore Inc.) we are authorized to feed ANY real estate virtual tour with a valid MLS number to the websites listed below free of charge as longs as the listing agent is a showcase member of Move.com/Realtor.com. 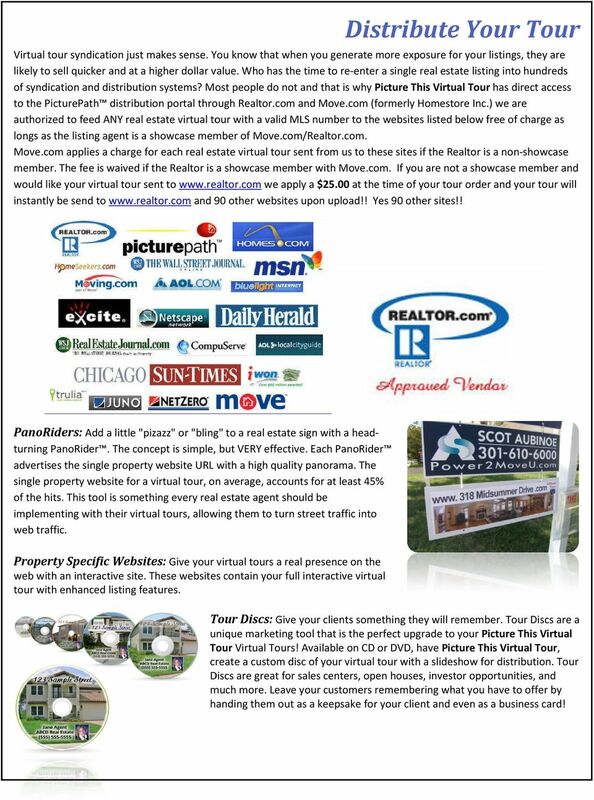 Move.com applies es a charge for each real estate virtual tour sent from us to these sites if the Realtor is a non-showcase non member. The fee is waived if the Realtor is a showcase member with Move.com. If you are not a showcase member and would like your virtual tour sent to we apply a $25.00 at the time of your tour order and your tour will instantly be send to and 90 other websites upon upload!! Yes 90 other sites!! PanoRiders: Add a little "pizazz" or "bling" to a real estate sign with a head headturning PanoRider. The concept is simple, but VERY effective. Each PanoRider PanoRider advertises the single property website URL with a high quality panorama. The single property website for a virtual tour, on average, accounts for at least 45% of the hits. This tool is something every real estate agent should be implementing with their virtual tours,, allowing them to turn street traffic into web traffic. 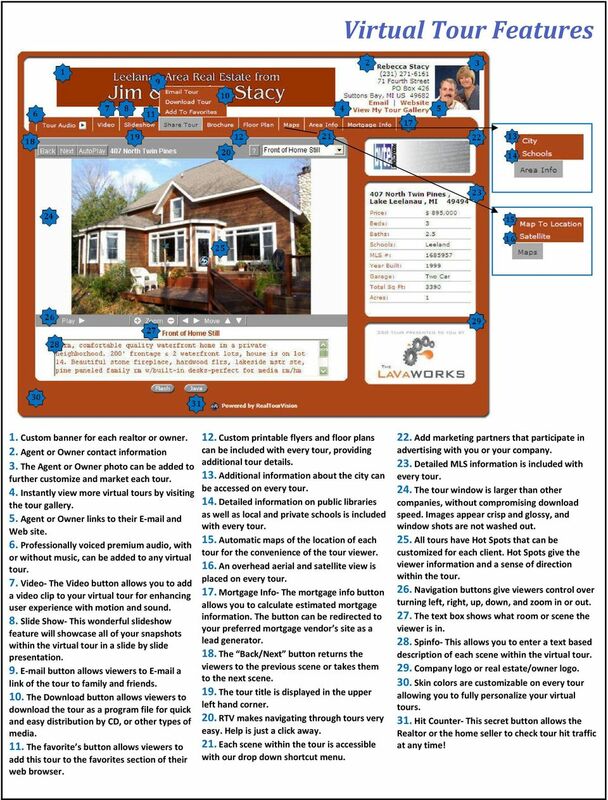 Property Specific Websites: Give your virtual tours a real presence on the web with an interactive site. These websites contain your full interactive virtual tour with enhanced listing features. Tour Discs: Give your clients something they will remember. 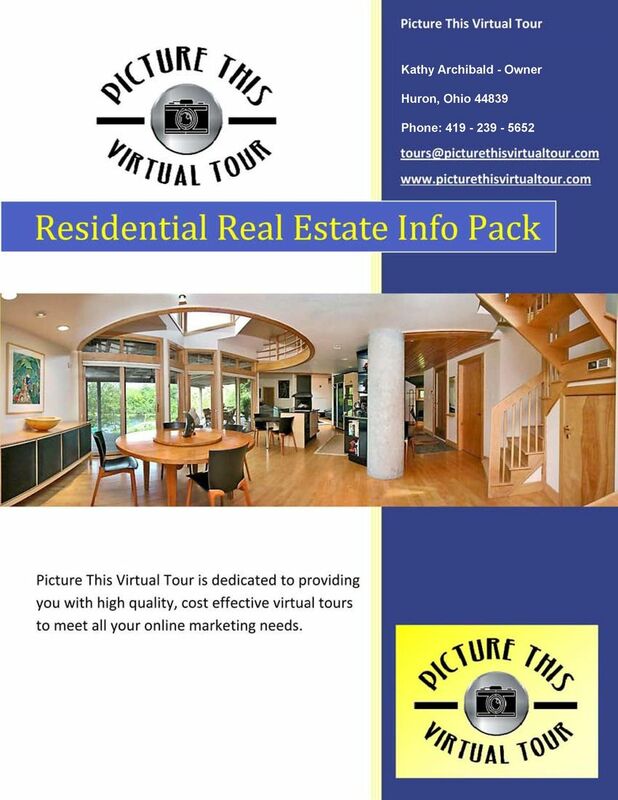 Tour Discs are a unique marketing tool that is the perfect up upgrade grade to your Picture This Virtual Tour Virtual Tours! Available on CD or DVD, have Picture This Virtual Tour, Tour create a custom disc of your virtual tour with a slideshow for distribution. Tour Discs are great for sales centers, open houses, investor opportunities, and much more more.. Leave your customers remembering what you have to offer by handing them out as a kee keepsake psake for your client and even as a business card! Website Planning Questionnaire. Introduction. Thank you for your interest in the services of The Ultimate Answer! Marina Marketing Programs Choice of 4 Affordable Marina Programs designed to fit any budget. At any level Marinas.com provides cuttingedge features that are all that you need in the marketing of your facility. How Local Businesses Can Use Mobile Applications to Attract and Retain More Customers Contents 1. Why not going mobile is unthinkable, for any business 2. How mobile apps can attract more customers 3. Create stunning flash movies online in minutes with the easiest flash maker in the world! Try the world's best online flash movie maker. Appendix B: Webcast FAQ s Terminology SN Glossary of Terms Live Event Live web casts capture the presentation as it happens, weather it is from a boardroom in Toronto or a Hotel half way around the world. Keefo s Design wants to be an integral partner in your success! Determine your objectives and target audience before planning the layout and design of your site. The main imovie window is divided into six major parts.